MayBug Games has released their first ever model. It seemed appropriate they'd make it a buggy, so they did. Here's a look at it. Our first miniature is now available for purchase! The aim with Buggy model project was to create a vehicle that will look cool, and you know, not everything with four wheels can be called buggy. John Marko managed to create concept art/artwork for a really dynamic and eye catching buggy miniature. - Grab this slab of metal and some rivets Mike we’re building buggy! And bring this barrel we will put it to good use. With Aleksander Marhall help we brought Johns design to life. The final effect gives the impression they used all they’ve got to get this buggy running. Now everything is up to you. 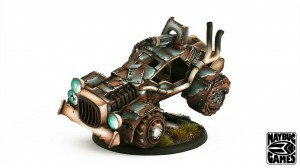 With right painting you can use this model as old army buggy or post apocalyptic scavengers vehicle. You can even use it for alien race that loots everything on their way in grim future of mankind. Model has multiple assembly options so you can have 3 of them in your army and easily make them look a little bit different. In each set there are 2 additional wheels and don’t ask us what to do with them. Scale is 28mm (80mm base). Our aim is to gather other passionate people from different disciplines, like graphic artist, 3D graphics, painters and sculptors to create more and more great miniatures! Contact us if you are interested. Feel free to leave a comment about our model!